Town Councilor Bob Vallee was recognized for 30+ years of service foe Franklin. This was his last Council meeting as he choose to not run again. The recognition was left off the posted agenda so that Bob would participate in the meeting per Council Chair Matt Kelly. 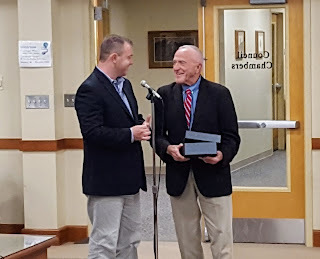 Kelly presented a token of appreciation and mentioned that the Council members has chipped in to purchase a chair with the Town seal on it so he could watch future meetings. All the councilors took turns in sharing a moment of recognition for Bob. Representative Roy presented a proclamation from the MA House of Representatives. Two new members were appointed to the Cultural Council. One was present at the meeting, the other had a conflict. 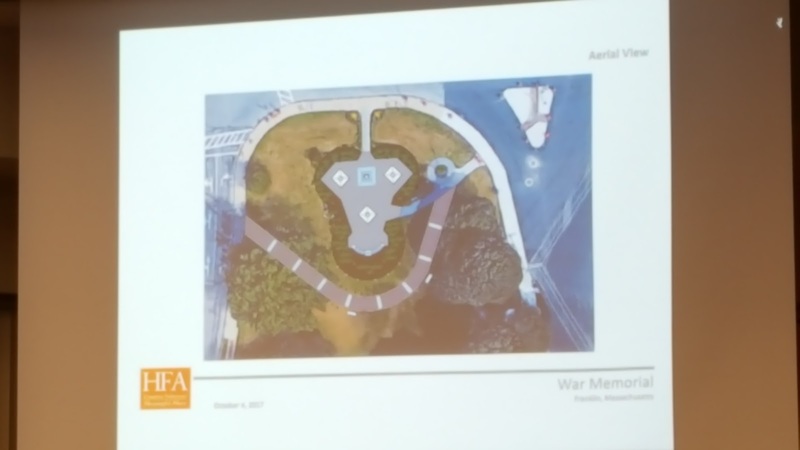 There was also a presentation of a proposed Veterans Walk to be added to the Town Common. The Council was supportive so the formal proposal will come forward in a future meeting. There were only a few items of legislation and all passed unanimously via roll call vote. Councilor Mercer was participating via remote phone connection. Additional details from the meeting can be found in the links reported live on Wednesday. When the Town publishes the "Actions Taken" for the meeting, that will be added here as well.